The SW-SMART anchor is a load distributive tension type removable anchor designed to uniformly transfer skin friction to the grout body and soil throughout the entire bond length rather than applying a concentrated force at the distal end of the anchor body. This anchor has been developed for the purpose of securing anchorage force in relatively weak soils of approx. N ≤10. Removal of the SW-SMART anchor is performed similar to that of the SW-RCD anchor. The steel strands along the free length of the anchor are housed in a plastic polyethylene sheath and are fully removable by disengaging the wedge in the small coupler separating the free length and the fixed length zones. The strands in the fixed zones remain permanently in the ground. They are also referred to as Single Bore Multiple Anchors (SBMA). 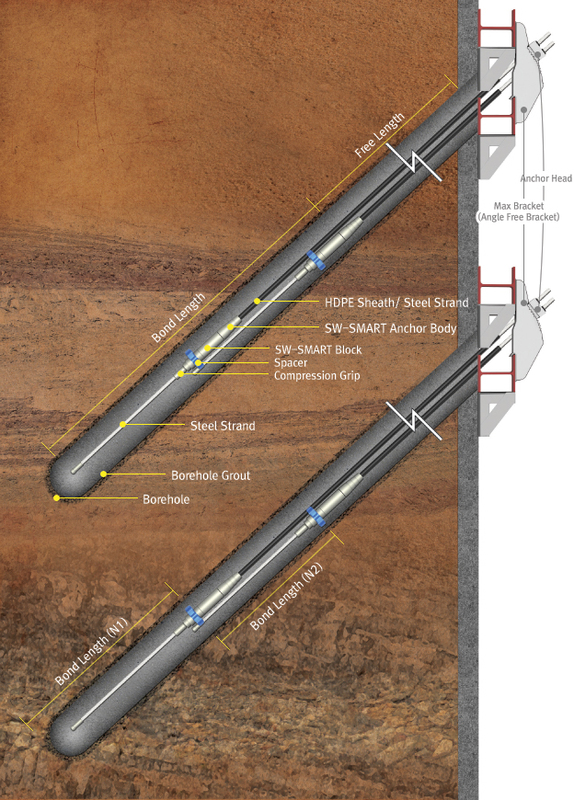 The anchor system involves the installation of multiple anchor units into a single borehole. Each unit has its own individual tendon, its own fixed length within the borehole and is loaded with its own unit stressing jack. The SW-SMART anchor is based on tension type, load distribution theory.